In healthcare environments, particularly Emergency Departments, time is vital. Minutes or seconds can make a real difference in patient care. It is crucial for NHS staff to be able to quickly, reliably, and securely access medical information when they need it. University Hospitals of Morecambe Bay wanted to spend less time on administration and lengthy log-in procedures and more time focusing on patient care. University Hospitals of Morecambe Bay is an NHS Foundation Trust in North West England, providing services in South Cumbria and North Lancashire in the Morecambe Bay area. The Trust operates from three main hospital sites: Furness General Hospital in Barrow, Royal Lancaster Infirmary in Lancaster, and Westmorland General Hospital in Kendal. Furness General Hospital and the Royal Lancaster Infirmary, as well as providing a range of other hospital services, both have full Accident & Emergency (A&E) Departments. The Trust has approximately 6,000 employees and provides services for more than 350,000 people. The Trust wanted to streamline log-in processes and support the user-switching / session roaming methods of working. FLOW, the mobile clinical desktop, significantly improved clinical workflows and allowed more time for patient care. Morecambe Bay were the first NHS Trust to adopt the Lorenzo electronic patient record (EPR) technology provided by CSC in 2010, as part of the National Programme for IT in the NHS. Although, Lorenzo offered a next-generation alternative to existing monolithic EPR systems by integrating a patient’s medical records, the implementation also introduced several problems. The main problem being accessibility and the speed of accessing patient records in Lorenzo by clinicians. This was especially true in the complex and fast-paced environment of the Accident & Emergency (A&E) department. When treating patients in A&E, clinicians typically move throughout the department and work from differing workstations accessing multiple applications. Each workstation and application requires its own log-in credentials and passwords, so the authentication and sign-on procedure to access patient details is often repeated. The multiple passwords required can also naturally lead to users forgetting their credentials or feeling the need to write them down causing a significant security concern. The repetitive authentication process also uses up vital clinician time – time that could be spent focussing on patients, especially in a time critical department such as A&E. Morecambe Bay were looking to streamline the log-in processes for their busy clinicians. They wanted clinicians to be less bothered by cumbersome authentication procedures and instead be supported in their user-switching and session roaming working environment. They were looking for a solution that allowed swifter access to Lorenzo and vital patient information, so that time could be better spent focusing on patient care. Our problems in the Emergency Department were around making Lorenzo more easily accessible. To enable swifter user log-ins, workstation user switching, and desktop roaming, ITHealth introduced FLOW – a solution that brings together four key components: Storage & Server (Blade & SAN was used originally in this case, but this was latterly replaced with Pivot 3 for scalability), Single Sign-On (SSO) technology, Virtual Desktop Infrastructure (VDI), and Spine persistence software (Isosec). All of these technologies can be integrated to work with the NHS Smartcard. Imprivata OneSign technology was used for the SSO element. It offers a single point of authentication that allows easy access to multiple applications and key patient data – negating the need to enter individual log-in credentials for each application wanting to be accessed. Reduced log-in requirements clearly saves valuable time; it also eliminates any password management issues for both users and the IT helpdesk, thus keeping systems and patient data more secure. The VDI used VMWare technologies (although Citrix/RDS can also be used). VMWare allows end-user desktops to be hosted on a virtual machine (VM) running on a centralised server (e.g. Pivot 3). Used in conjunction with session persistence software (such as Isosec), it means that when a clinician logs off one workstation, their desktop and Spine applications can be suspended and preserved until they log on to another at which point their desktop and applications can be re-launched just as they had left them. Their desktop basically follows them as they move from location to location throughout the department. Again, it saves the clinician vital time as they don’t need to re-open applications to continue working on a new workstation. Smartcard is inserted into any configured Windows based device and the user PIN is entered. Single sign-on technology confirms user credentials and logs the user into their workstation. Clinician is rapidly presented with their ‘hot’ virtual desktop. The clinician continues their session using Spine patient applications, such as Lorenzo. A user removes their Smartcard when they wish to switch workstation – their virtual desktop is suspended. Session Persistence software on the virtual desktop ensures any open Spine enabled applications are kept open until the user next logs-on. Each time the clinician logs-on, the same process is performed offering a streamlined workflow, rapidly allowing the clinician to continue working exactly where they had left off. The result is vital time savings. We got log-in down to 15 seconds, but when clinicians need to log-in on multiple occasions, that can take up a lot of time. 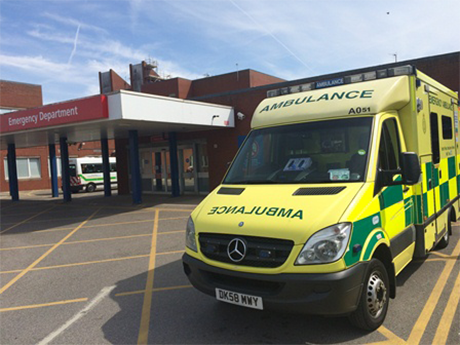 This new technology has revolutionised the Morecambe Bay A&E department and has streamlined A&E clinical workflows. IT is now seen as much more of an enabler as opposed to an inhibitor to working, thus increasing clinician confidence and satisfaction. The vital time saved on cumbersome log-in processes is now much better spent focusing on patient care. Security is also less compromised given that password management is no longer an issue and a key information governance issue is also solved as there is no risk of staff staying logged on to a system when they walk away from a computer. Described as a ‘game changer’ by Andy Wicks, FLOW has proved so successful that they’ve decided to run a further pilot in the Outpatients department. The impact there could be even greater as the clinical staff use two rooms for the consultation process. With FLOW, as they move from one to another, they can simply activate the new system with their NHS Smartcard and instantly pick up where they left off. There would be no need to scribble down hasty notes before moving to the consultation room. FLOW has allowed our clinicians to walk up to a PC, use the smartcard and instantly log on to Lorenzo and PACS. You do what you need to, pull out your smartcard and the PC locks. When you log on to another machine, your session is exactly where you left it.